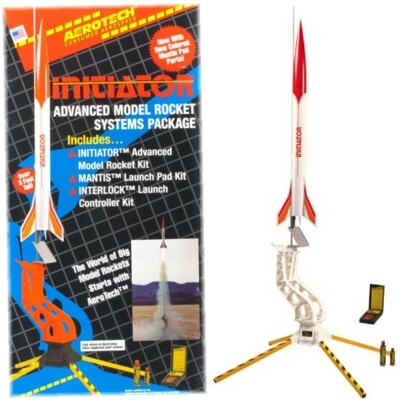 The Initiator Starter Set is the perfect introduction to the thunderous experience of E, F, and G powered rockets. This comprehensive set of rocket kitset and launching equipment includes the one metre tall Initiator rocket, Mantis advanced rocket launch pad, Interlock 12 volt launch controller, and complete illustrated assembly instructions. Intended for use with either single-use (SU) or RMS motors (motors sold separately). Note: to use reloadable (RMS) motors you will need to purchase the RMS 29/40-120 motor hardware.